Macherey Nagel arsenic low range test strips. 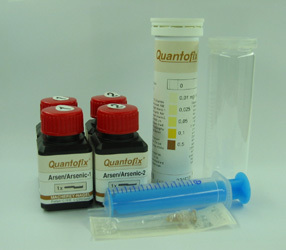 These are suitable for testing arsenic in drinking water. Range 0 - 0.5 mg/l. Gradation 0, 0.01. 0.025, 0.05, 0.1, 0.5 mg/l. For reference 0.5 mg/l = 500 ppb, 0.05 mg/l = 50 ppb etc. Based on health considerations the concentration of arsenic in drinking water should not exceed 0.007 mg/l (7 ppb) (NHMRC, 2004). 100 test strips in a reagent set that includes reagents and reaction vessels.